Hate getting up just before the crack of dawn to go for a run, or even earlier to make it to the starting line of a race? Prefer something with a little more relaxed schedule? In conjunction with the Wine & Dine weekend at Walt Disney World, the Disney Wine & Dine Half Marathon is a fun way to experience the nightlife in the parks. This point-to-point course begins at 10:00 PM at the ESPN Wide World Of Sports Complex and finishes in Epcot. The finish line party continues until 4:00 AM with 25 food and wine kiosks and plenty of entertainment. Register early to ensure a spot before it sells out. What better way is there to see Las Vegas than by running down the strip at night? 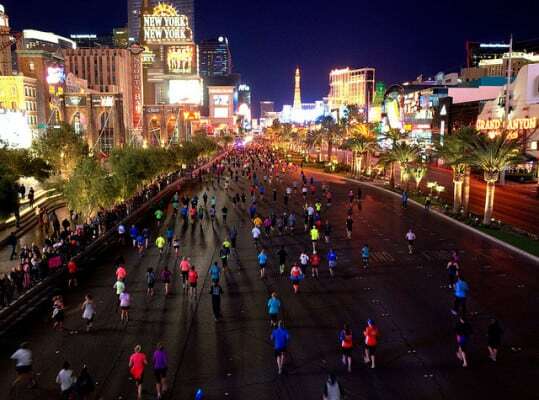 The Rock ‘n’ Roll Las Vegas is an out-and-back course that takes runners past some of the most recognizable landmarks of the city. Runners begin between 4:30 PM and 5:20 PM depending on their wave and have four hours to cross the finish line. As one of seven races of the Michigan Half Series, this summer race at night is a great way to beat the heat. Runners begin at 9:00 PM on a flat and fast out-and-back course. As a race entry gift, runners will receive either a headlamp or flashlight to help them navigate the paved course along the Fred Meijer Rail Trail system. The awards are pretty awesome for a small race; the fastest runner in each age group wins a pair of running shoes. Near the mysterious Area 51, the E.T. Full Moon Midnight Half Marathon will be part of a memorable weekend. Located 2 1/2 hours from Las Vegas, this race will require a little advanced planning because of the location and the time of day. Runners begin at 12:30 AM and race a point-to-point course that ends in the town of Rachel, Nevada. Shuttle buses will be available all night to transport runners to the start as well as back to Las Vegas. The Rock The Night Away Trail Run is a challenging night course for trail runners. Races encounter approximately 3,000 feet in elevation change and the entire course is on a single track trail. All runners must bring their own flashlights and/or headlamps as it will be dark by 9:00 PM. This Friday night race is a fun way to start the weekend and runners are encouraged enjoy the post-race party and camp nearby. The Moonlight Races are offered in conjunction with earlier day races. Runners seeking an extra challenge can sign up for both. The evening race starts at 6:00 PM and the half marathon course covers the trails of Bootleg Canyon. With 1,590 feet of vertical climb, this course is not for the beginner. Bring your own hydration system and lights–aid stations will provide jugged water and food goodies. Roswell, New Mexico is famous for the 1947 UFO incident, whereas Roswell, Georgia could be most famous for the best place for a night half marathon PR. This flat and fast race begins at 7:00 PM will be warm despite the darkening skies. Runners will be required to wear a headlamp to navigate the out-and-back course along the Chattahoochee River. Sign up early to get one of the 2,100 spots available for this popular race. Limited to 700 runners, the Summer Night Trail Marathon offers three different distances, including a half marathon. Runners will complete two of the 6.55-mile loops in Eagle Creek Park. The first section of the course is single track, but widens to dirt and gravel double-track after a half mile. Beginning at 9:30 PM, runners are required to have a headlamp throughout the race. Part party, part race, the Moonlight Madness Half Marathon is a fun way to spend a spring Saturday night in Dallas. Beginning at 8:00 PM at the Community Beer Company, this race offers all kinds of incentives to join the party. Racers receive four glow sticks to light up the course, two finisher medals (one to show and one to wear), and a post-race party at a brewery. The course is mostly out-and-back and crisscrosses the Trinity River in downtown Dallas. Disney Wine and Dine is in the morning now. 5:30am. Yes Disney disappointed a whole lot of us by making the wine and dine a daytime run….